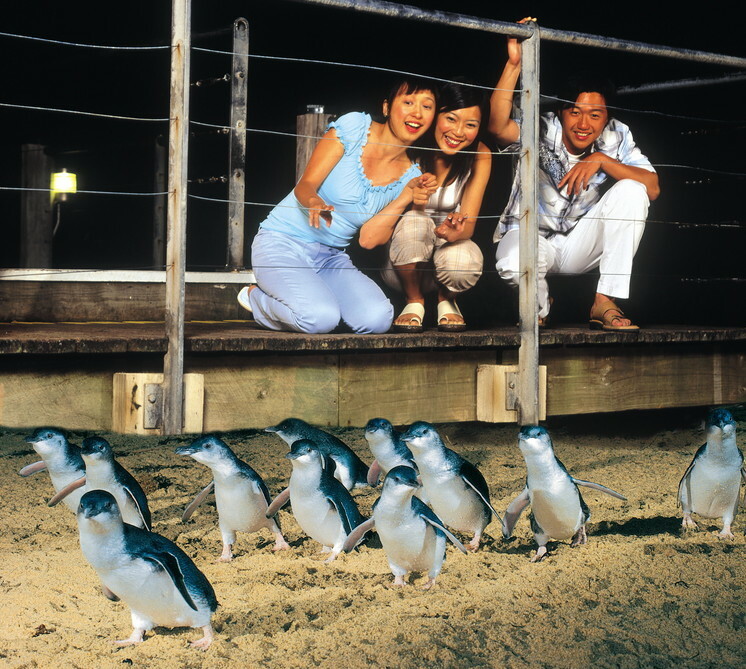 See the famous Penguin Parade of Phillip Island. Travelling from Melbourne, we start our day with lunch (Oct-Mar) in Tooradin. We then head over to Maru Animal Park, where we get to meet some furry Australian favourites. Get up close with koalas and handfeed kangaroos, wallabies and emus. Travel over the bridge and onto Phillip Island, which is known for its rugged cliffs, sandy beaches, natural beauty and unique wildlife experiences. Watch and be amazed by the giant surf at Woolamai Beach and spend time enjoying a serene coastal walk. Take a stroll along the coastal boardwalk at the Nobbies rocks and view the stunning rocky coastline, home to a colony of Australian fur seals. Enjoy a pizza dinner (Apr- Sep) overlooking the beach at Cowes before heading off to view the Penguin Parade. Check out the award winning Visitors Centre and as the sun begins to set, watch the cute little penguins emerge from the sea and waddle across the beach and return home to their sand dune burrows. After the parade has ended, your driver guide will drop you off for your overnight accommodation. The day is free for you to explore this beautiful area. This evening your driver guide will collect you from the YHA. Relax as we head back to Melbourne.